Happy New Year to Yazoo County, and Happy Bicentennial Year to Mississippi! 2016 in Yazoo was one for the record books. 18 events received funding from Yazoo County CVB through our Event Sponsorship and Tourism Grant programs to take place in Yazoo County during our last fiscal year (October 2015-September 2016). Annual events like the Jerry Clower Festival, Bentonia Blues Festival, Gospel Explosion, and Antique Days were joined on our calendar by events like Picnic in the Pasture, The Moving Wall, Ole River Bass Club tournament and Yaz Summer Blast, just to name a few. And, as if that were not enough, countless other events and programs received support through our office such as receiving information about area programs, free promotional assistance through the web and social media, and event planning consultation. It was truly an incredible year! 2017 is positioned to be a banner year for the entire state of Mississippi, and we hope for Yazoo County as well. As you may know, Mississippi became the 20th state in the United States of America on December 10, 1817. We cannot overlook the HUGE place that Yazoo County has been honored to take for Mississippi’s 200th year. Later this year, the United States Postal Service will issue a special Forever Stamp to commemorate this historic year. 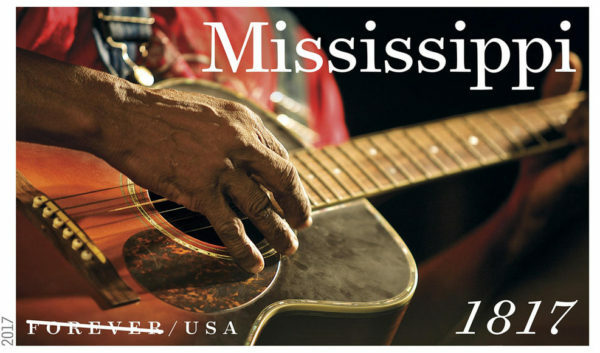 The Mississippi Statehood stamp, designed to highlight Mississippi’s place as the birthplace of the blues, features a photo of Bentonia blues musician Jimmy “Duck” Holmes from Bentonia, Yazoo County, Mississippi. The close-up image of Mr. Holmes’ hands strumming the Bentonia blues on his acoustic guitar could not better represent the state’s musical history. After all, Mr. Holmes is the proprietor of the state’s oldest juke joint that is still in daily operation, the Blue Front Cafe, and the last person to perform the unique Bentonia style of blues who learned it from the masters themselves. Jimmy “Duck” Holmes is the blues artist in an image by photographer Lou Bopp which was chosen as the art for the Forever Stamp to be issued by the USPS in honor of Mississippi’s Bicentennial in 2017. What an honor and a privilege for Yazoo County to represent our home state in this way. Events to honor Mr. Holmes’ and Bentonia’s place on the Mississippi Statehood Forever Stamp are being planned, and we will be sure to keep you informed here and on social media. We also learned recently that Mr. Holmes was nominated for two Blues Music Awards from The Blues Foundation. We could not be more proud! Yazoo City will soon see the opening of a new Walmart on the recently-opened Willie Morris Parkway. This is a development which will also help encourage people from surrounding areas to take a closer look and spend more time in Yazoo. We hope that you will be one of those people! While you are here, don’t miss the opportunity to explore the off-the-beaten-path areas of Yazoo, including the shopping areas in the rest of the City and County. There you will find thrilling deals and unique items that the big box stores can’t offer. And, with over 30 locally-owned restaurants and eateries in Yazoo County, you could shop at and eat in Yazoo every day for a month and not experience the same meals or deals. We call that a win-win! To keep up with the news on all the things to do and see in Yazoo County, be sure to follow or like us on Facebook, Twitter, and Instagram as VisitYazoo. Happy New Year from Yazoo County, Mississippi. Let’s make it a great one! I visited the Blue Front Cafe a few times last year to see and hearMr.Jimmy Duck Holmes play the Blues.will be going back this year again.